Things have been slow in the markets. From late summer and in to early fall, volatility increased, culminating in the sharp sell off and bounce back seen during October. But since bouncing off the October 15 lows and returning to all-time highs, the S&P 500 has completely gone to sleep. And the last five closes on the S&P 500 have been in the tightest range since Lyndon Johnson was president. A number of folks were pointing out just how slow its been on Twitter. Finance blogger (and great Twitter follow) Eddy Elfenbein pointed out that the last five trading days have seen the S&P 500 move +0.07%, -0,07%, +0.05%, +0.02% and +0.07%, respectively. Shades of June for the stock market. And Elfenbein added that since October 22, the S&P 500 hasn’t declined more than 0.3% in one session. At current levels, that’s equivalent to about a 6 point move, so basically the S&P 500 hasn’t done anything but go up in weeks. 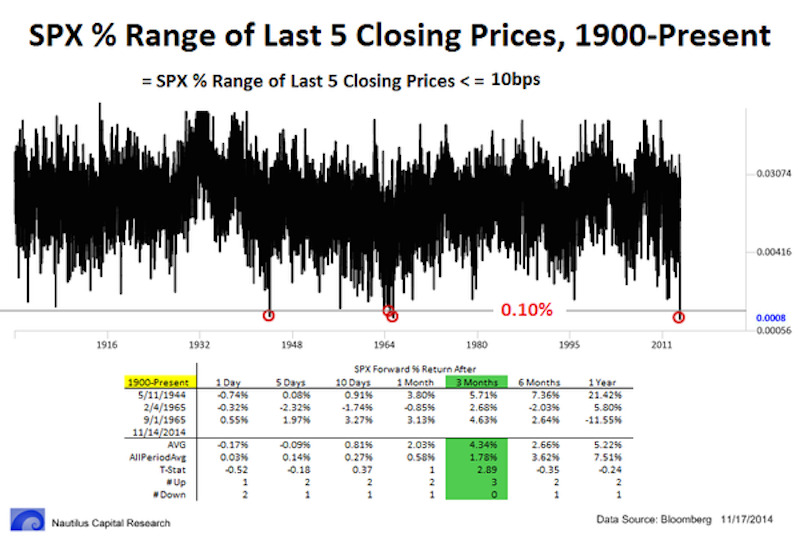 But the folks over at Nautilus Research put these observations in some perspective, noting that the last five closes have been in the tightest 5-day S&P 500 range since 1964! And what’s more, this is just the fourth time since 1900 that the S&P 500 has closed within such a narrow range. Here’s the chart. That’s what a sleepy market looks like.